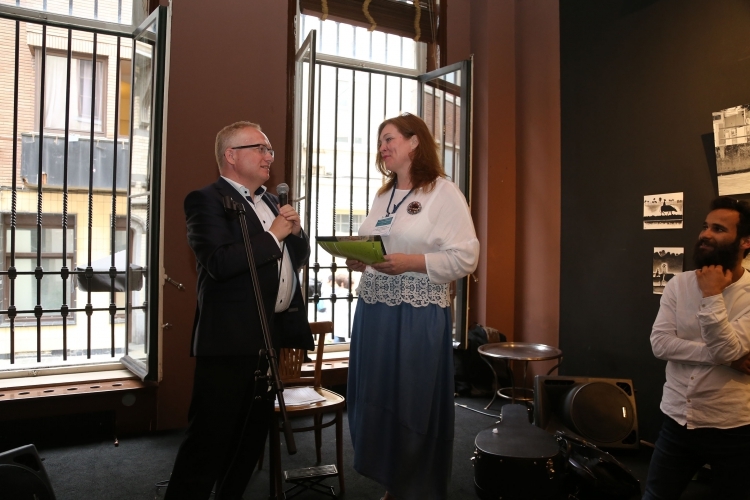 EAEA President Per Paludan Hansen handed out this year's EAEA Grundtvig Awards. EAEA GRUNDTVIG AWARD 2016. A creative approach to human reconciliation can build an open dialogue between resettlers and local communities – this is the belief of the Integration and Development Center for Information and Research in Ukraine, who won the 2016 Grundtvig Award in the category of National and Regional Projects. Yuliya Golodnikova from IDCIR and Oleg Smirnov from DVV International Ukraine explained at the EAEA General Assembly in June what makes their project stand out. A flash mob, a street quest and an art exhibition in an air-raid shelter. These are not suggestions for a Saturday in a hip European capital, but examples of civic initiatives that were part of the project that won this year’s EAEA Grundtvig Award. From Destruction to Creation. Ways of Reconciliation in the Ukrainian Society was implemented by the Integration and Development Center for Information and Research in Ukraine (IDCIR) in partnership with DVV International Ukraine. The project emphasized a problem rarely discussed in international media, that of internally displaced persons (IDPs) and their struggle to integrate in new communities. The idea was to transform a growing conflict potential into mutual trust and opportunities for open dialogue. Why a project about IDPs? From destruction to creation: where to start? Some steps had to be taken to facilitate the integration of IDPs in their new towns and cities. As Yuliya explained, the project foresaw grants for as many as sixteen local initiatives in eleven regions in Ukraine. “All change in Ukraine starts with the community. This is why it was so important for us to engage local residents and invite projects that were very participatory,” she said. 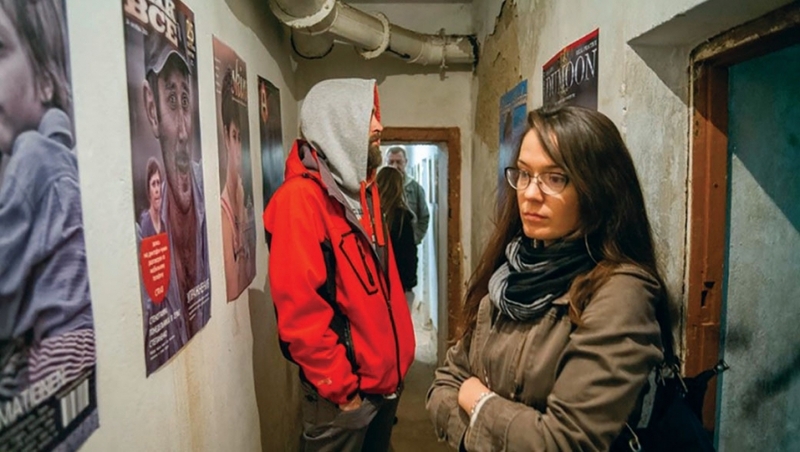 The result was encouraging to say the least: the art exhibition in the air-raid shelter, organized in Kherson, met with a keen interest of not only the town residents, but also local authorities. The trainings and flash mobs on hate speech, which took place in Kherson and Odessa regions, engaged over 1,000 local residents, who felt encouraged to openly speak about the problem of hate speech. In fact, the events were so successful, that they were continued in other Ukrainian cities and towns, which was not initially planned. Such spontaneity was a recurring theme of the project. “New, unplanned initiatives sprung up – someone knocked at the doors of resettlers’ houses and invited them to a concert, gathered people for tea and offered to talk,” Yuliya listed the examples. The project also created a network of like-minded organisations that interacted together while organizing art festivals, biographical cafes, conflict prevention sessions or movie screenings. With representatives of NGOs, libraries, museums, galleries, as well as teachers, students and public servants coming together, the project opened doors for future initiatives and offered more opportunities for cooperation. The initiative lives on and both Yuliya and Oleg believe that it can create lasting change. “We are now implementing the third stage of the project, which foresees opening new adult education centers,” Yuliya said. By expanding the network and creating a fresh space for debate, the project continues to show that adult education can help remove intercultural misunderstandings and prevent conflicts.